We thought the women’s 2015 Team Time Trial at the 2015 Road Cycling World Championships would be the most unpredictable TTT Worlds yet, and wow, it was even better – excitement all the way to the end. So if you missed it, you might be kicking yourself…. but that’s OK, I’m here to help with videos, results, photos, rider reactions and more! And the full race replay, commentated by Rochelle Gilmore and Ant McCrossan. You can get free automated updates via the iTunes store here (go votes us up if you can, it’d be nice to top the rankings) or via our RSS feed here. Check out Velofocus’ galleries of Thuringen-Rundfahrt here. Here’s Tayler Wiles’ stage two diary on her heartbreaking missed chance to win the stage. And here’s her diary on the last day of the race. You can also catch the BMX World Championships live here. Here’s the article with Rochelle Gilmore about the development of Mayuko Hagiwara that Dan was talking about. Also, some video from the BeNe tour is here. I received a first communication from the Tour of California to gauge our interest in the event in mid December 2014, which was followed up by an invitation in mid January. Most of the other new USA UCI events I found out through the cycling press (I did receive a contact from the new organisers of the Philly World Cup in Mid February after they were appointed). The same applies to the South African event (I am only aware of 1 race, last week end Hibiscus). On one hand it is great that Women’s Cycling is seeing this sort of growth into new areas and it is to be expected that this can happen on short notice, such is the budding nature of the discipline. For more videos of rider views of Qatar, check out Vale’s ORICA-AIS team-mate Gracie Elvin‘s fantastic youtube channel, and the Wiggle Honda videos. And if you want to watch the final stage live tomorrow, I have a guide. 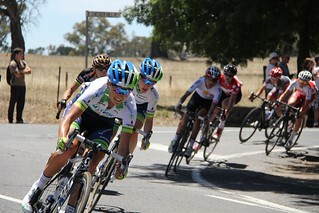 Guest blog: Tour Down Under – Stage 3: Forza Italia! It was a successful day for both Italian riders at Stage 3 of the Santos Tour Down Under as action moved back onto the road. A tough 71km course from Tanunda in the heart of the Barossa Valley wine region, to Campbelltown on the outskirts of Adelaide whittled the peloton down to 9 riders at the finish as Giorgia Bronzini (Wiggle) won the bunch sprint. The group contained race leader Valentina Scandolara (Orica AIS) who finished with the same time to make sure she retained the Blue Leader’s Jersey and put herself in an excellent position to take the GC after tomorrow’s final crit.